Of all the unexpected places to find this, the home improvement store Lowes has been publishing a series of Halloween decor suggestions. 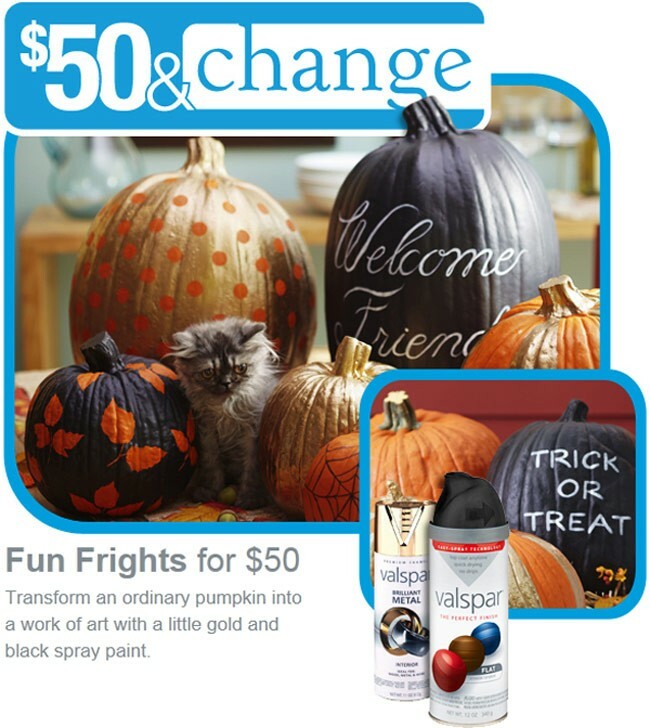 For the low low price of $50, you can get a bunch of pumpkins and gold and black spray paint to, uhm, decorate the pumpkins of course. What else would anyone use spray paint for on Halloween? Trick or treat! The Lowes suggested pumpkin decoration designs are very pretty and all promo images are improved by the deft inclusion of a cute kitten. As the weather cools and the leaves begin to fall, transform a pumpkin into a gilded autumn beauty. Posted by Gothic.org on October 22, 2012. Filed under Decor, Headline. You can follow any responses to this entry through the RSS 2.0. Responses are currently closed, but you can trackback from your own site.